At the request of a reader and in a never ending effort convince everyone possible to give these games an honest try I've decided to try and put together a beginner's guide to the Souls games! I won't go into anything TOO complex since this IS a beginner's guide, but any specific questions you still have can be asked in the comments below! I'll also include Bloodborne in this because it's the new hotness right about now. So let's get started with a few basic questions you may have! What are the Souls games? These games are action rpg's. What that means is that you'll be controlling one character from third person PoV with an attack button, a dodge button, etc. You'll kill enemies and be rewarded with "souls" which serve as both currency and experience. When you die you drop these souls at the spot of your death and you must return to that spot to pick them back up. You spend X amount of souls to increase your level by one, which gives you one extra point to put into your attributes, and then the number of souls required to level will increase each time. The Souls games are characterized by the many different ways you can play them, and different playstyles will require different stat allocation. This can seem daunting, but if all else fails then a simple Vitality, Endurance, and Strength (or Dexterity, your choice) spread will give you your basic sword and board Souls experience in any of the 3 Souls games. The basic playstyle in these games is generally with a melee weapon in one hand and a shield in the other, except for in Bloodborne where your shield will be replaced with a gun that is used to interrupt enemies and set them up for counter attacks. Do these games have a story? Actually, despite popular opinion, these games do have quite intricate and interesting stories! The stories are simply not thrust into your face and explained for you. If you want to get the most out of a Souls game then you'll want to talk to every NPC you meet multiple times (until they start repeating dialogue), read item descriptions for everything you pick up, and most importantly pay attention to the world around you. If you finish one of these games and find yourself wanting to learn more then there are many people on youtube who make lore videos designed around teaching you all the great stories in these games that you may have missed. Just how hard are these games? The Souls games are challenging but they are by no means unbeatable or only for the most pro of gamers. I find that the main thing that keeps people from trying the Souls games is how difficult they hear they are, and that's a shame. You'll have heard that they're super hard or that they'll make you break your controllers, it's popular to play up the difficulty of these games, but at the end of the day if you give it an honest effort and are willing to learn from your mistakes then anyone can make it through a Souls game. The only thing that will stop you from beating a Souls game is giving up. Do these games have multiplayer? Yes! But it's a bit of a unique kind of multiplayer. Simply being online will connect you to others. You'll see messages that people have left (and leave some of your own! ), you'll see ghostly figures of others who are playing at the same time, and you can summon others in to help you or be invaded by someone looking to kill you. The specifics of how multiplayer works depends on the game you're playing. Generally you can only summon help while you're in human form, meaning you haven't died recently or have used an item that restores your humanity. You won't be inviting a friend into your game to help directly, instead by being in human form you'll see glyphs of the ground where other players have left their "summon sign". By going up to one such sign you can summon the creator of it into your game to help you for a bit. By opening up yourself to co-op you'll also be opening yourself up to be invaded by other players who'd like to come kill you! If that kind of thing doesn't interest you then you can play offline. Demon's Souls, as the first game of its kind, is probably the most creative and unique of the Souls games, particularly in regards to its world and characters. Locations and people from DeS have influenced every other Souls games, to a surprising degree. Unfortunately DeS also suffers from being the least enjoyable to pick up and actually play through. Its weapon upgrade system is complex to an unnecessary degree and on top of having a pretty harsh equipment burden you also have an inventory limit, meaning that you can only carry a certain amount of stuff with you on your adventures. Dying in this game will also revert you to "soul" form, where your max health is cut in half until you kill a boss or use an item that gives you back your human body. It has a consumable based healing system, meaning that you'll acquire different types of herbs by playing and you'll use these to heal yourself. There are A LOT of healing items in this game though so you're not likely to run out. It's world is also more disjointed and presented in more of a level by level gameplay experience in that you'll visit world 1-1, 1-2, 2-1, etc, though each world can be done in whatever order you choose. To make up for this, each world is fairly expansive and has shortcuts for you to find and open up to ease your exploration. You also have access to a hub world called the Nexus where you'll return to level up, purchase things, store items, etc. Dark Souls 1 takes much of Demon's Souls and tries to perfect it. Many locations and events are inspired heavily by DeS, but this time around the world is a large connected one. The world of DS1 is a layered one, with areas on top of and next to each other that connect back to each other in surprising ways. In addition to upping the weapon and armor variety significantly, it removes the inventory cap, allowing you to carry as much as you want, and makes its equipment burden more lenient and easier to upgrade through leveling. 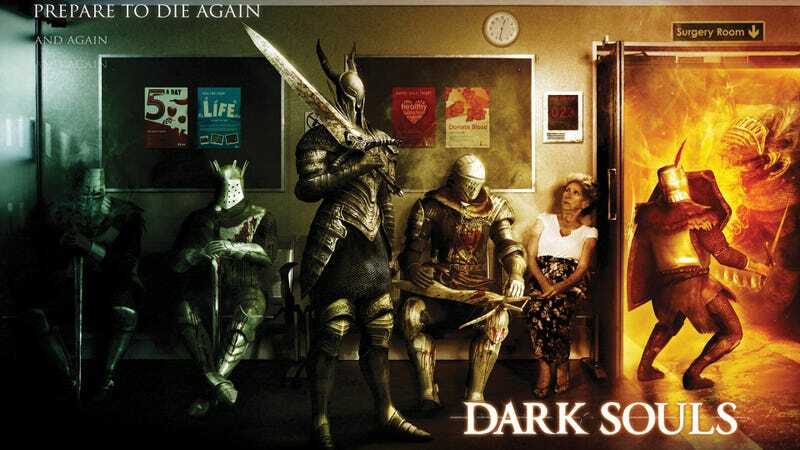 The healing system in DS1 becomes a hybrid experience. You gain an item called an Estus Flask which holds multiple healing charges which refill automatically when you die or sit at a bonfire (Dark Souls' version of checkpoints), and you'll find items called Humanities which can be consumed at any time to give you full life. Dying in DS1 doesn't cut your health down but instead makes you "hollow" which has no negative side effects other than taking away your ability to summon co-op help. The weapon upgrade system has been toned down a bit compared to DeS but can still be a bit daunting and require you to look up info online if you want to delve deeply into it, though that's not really necessary to get through the game. Having one large world can make it easier to get lost and not know where to go next, but it also does a much better job of rewarding your sense of exploration and discovery. Dark Souls 2 replaces the layered world of DS1 with more of an expansive world, similar to a Zelda map, where you'll strike off in one direction, come back to the center, and then go off in another. DS2 seeks to tame some of the needlessly complex systems from DS1 while also adding to the variety of playstyles on offer. If you want a playground of different ways to play then DS2 will likely offer you the most variety in that regard, with its addition of powerstancing (viable dual wielding), a smarter pyromancy system, and dark magic as its own style. DS2 keeps the hybrid healing of DS1 so you'll still have your Estus Flask but instead of the full heal humanities you'll get life gems which are closer to the herbs of DeS except that they heal slowly over time instead of instantly. DS2 also introduces a system where your max health will slowly decrease each time you die, but will never fall below 50% (75% if you have a special ring equipped), but there are numerable items in this game (called Human Effigies) that will restore your max health. Where DS2 falls behind is in its characters and its boss design. While DeS and DS1 have many memorable characters, DS2 has only a couple, with others that should be interesting but feel unfinished. It's bosses can also lack the wow factor of previous installments. Bloodborne, while not technically a Souls game, takes the core bits of those games and applies them to a new and focused creation. If you want to get the most straightforward and understandable (from a mechanical standpoint) experience then Bloodborne is the way to go. The weapon upgrade system is incredibly straightforward and there is no form of equipment load. This game replaces the playstyle variety of the Souls games with a fast paced, in your face style of combat that handles its weapon options in a "quality over quantity" fashion. Healing in Bloodborne is done via the use of Blood Vials, which can be found in the environment, dropped by enemies, or purchased at the vendor. You can only hold 20 at a time but any extras you pick up are immediately sent to your storage and auto refill when you die. The world is most similar to that of DS1, in that it wraps around itself, but its setting is wholly unique and fascinating. You also have the return of a hub world with the Hunter's Dream, where you'll level up, buy items, and upgrade weapons. If you find the sheer number of different ways to play the Souls games a bit daunting and want an experience that is build around a specific style of play then Bloodborne is the way to go. Overall you can't really go wrong with which game you choose to play first. They're all fantastic games with different strengths and weaknesses. If there are any more specific questions you have then feel free to ask. Otherwise I hope this has been of some help and will convince some people to take the leap and give these games a shot. Thanks for reading!